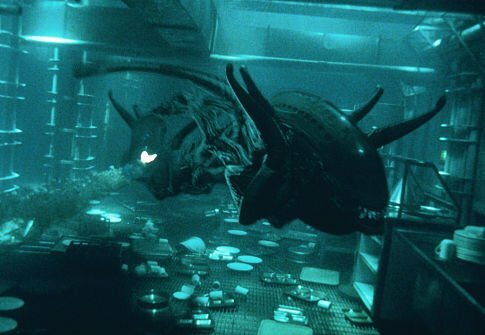 Set yet further still into the future, several hundreds of years after the events of Alien 3, Resurrection has the titular beasts at long last under the control of the large corporations. How might that be possible, given they most were wiped out in the three previous entries? Genetics of course. Scientific technological advancement has reached such a sophisticated point by now that the tiniest samples of DNA are sufficient in recreating life. Somehow, someway, scientists founds strands of Ellen Ripley's (Sigourney Weaver) DNA back on Fiorina (the intensive labour planet from the third film). Given that Ripley had been pregnant with an alien, the queen no less, science has not only artificially created a queen, but said female monster has dutifully given birth to an army of alien warriors which can be studied at length by a team of very peculiar looking scientists (one of them played by the always unique Brad Dourif!). 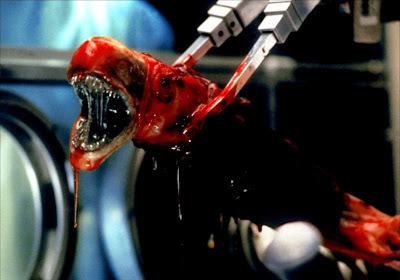 If that was not enough, Ripley herself has been genetically re-engineered. She is not quite her old self, seeing as she is gifted with greater than ordinary strength and agility. 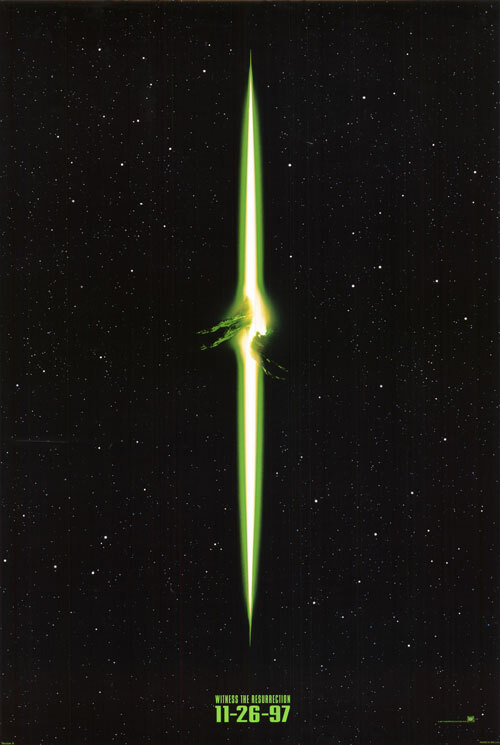 However, once the aliens escape captivity on a large military-scientific vessel, she may be the only chance for survival for a team of smugglers, among them another android (Winona Ryder), a little man in a gizmo-adorned wheelchair (Dominique Pinon), an abrasive, trigger happy goon (Ron Pearlman) and their pseudo leader (Michael Wincott). 15 years onwards since its theatrical release and the plot device about bringing Ripley back via genetics, but only in capacity that she re-emerge as some sorry clone of herself, lacking the recognizably human traits which made her such a rich character to cherish, is still irksome. 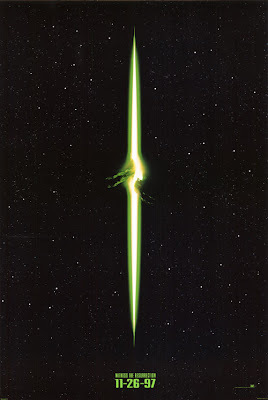 There is undoubtedly an argument to be made that the decision was a brave one, a bold one, one which adequately followed in the footsteps of the three preceding episodes in that it makes Alien Resurrection its own unique experience, but it always felt as though the negatives of the decision far outweighed the positives. If Ripley, the sole recognizable face of the franchise to return (and, given her nature in this fourth film, her face is indeed all that is recognizable), then other individuals will have to step up to the plate in order to fill the awkward void. On paper, there are numerous human characters who follow Ripley and each and every dark, treacherous corridors, the downtrodden clinic centres and even underwater, but saying that they are human 'at least on paper' is pretty much as far as one can go. Virtually none of the side characters bring anything notable to the picture, either in terms of charisma or as genuine supporters of the story arc. Having a cold, emotionally vapid Ripley clone is one thing. Having the majority of the supposed supporting players supply little in terms of desperately needed identity, save gross stereotypes, does help one iota. The only two exceptions to this admittedly grand accusation are Dominique Pinon and Winona Ryder. It most definitely is not because either of their roles is written with much cleverness or inventiveness, but rather because the actors themselves, through their own strengths and the aura, the presence within scenes that each can bring, help keep their heads afloat, if only slightly, above the sea of, well, no need to be that too explicit. Pinon, clearly a Frenchman trying to play some variation of what Europeans probably think Americans are like, is at times capable of supplying some decent chuckles, although that may just be because he is, after all, a Frenchman seemingly playing what Europeans might think typical Americans are like, not because the performance is technically brilliant. Ryder, on the other hand, sees her handle the most complex character in the film, an android who really is attempting to be like a human. It is a nice effort, with Ryder being quite good ate playing childish innocence with a sense of quirk that can work in certain scenes. An incredibly powerful individual she is not, although anything remotely superior to the rest of the lame brains the viewer is stuck with sounds rather promising. Another disappointment with the picture is the plot itself. First and foremost, the film is all plot and no story, which does not help to begin with. In fairness, the same criticism could be aimed at the original, Alien. Then again, how many films are like Alien , films that can pull off being not merely a good movie, but an excellent movie with mostly just plot?... Right. We rest our case, moving on. So Resurrection is hampered by a mundane plot, which is bitingly ironic seeing as how the film features, as the starting point for its plot, the circumstances the military industrial complex has desired for literally decades : complete control over a hive of aliens. Given that this is part of the horror and science-fiction genre, what possible outcome could there be when corporations and the military, each driven by the dark clouds of greed and power, lay claim to vile, nearly indestructible and impressively hostile such as these? They escape and tear everything and everyone in their sight to shreds. So, naturally the film does just that. That is, unfortunately, a problem rather than a strength. There is no 'ironic fun' to be had when watching the inevitable disaster unfold and subsequently snowball. The unoriginality of the concept is already a sufficiently critical handicap. Had the film dealt with the material in any inventive manner, then things might have turned out differently, yet the proof is in the pudding. The first half hour is as bland as can be, therefore when the aliens make their escape from captivity, it is frustratingly difficult to feel involved with what is happening and, more importantly, to whom it is happening. 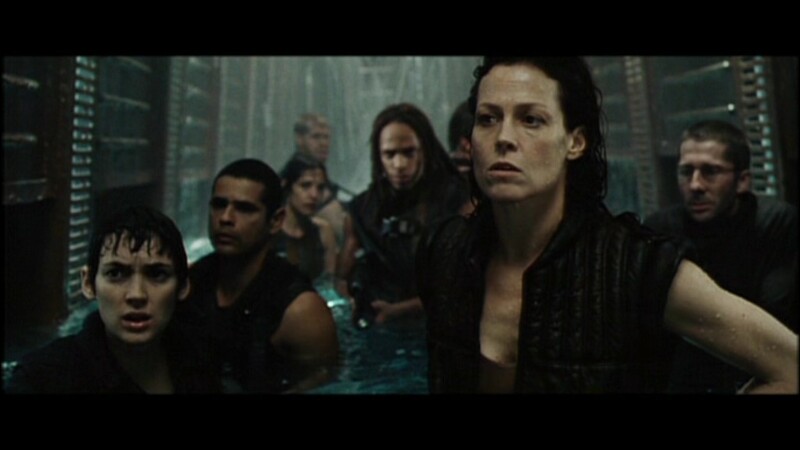 As improbable as this might sound to Alien 3 haters, there are sections in Resurrection that have this movie fan wanting to return to the labour camps of Fiorina. At least Charles S. Dutton was there... not to mention the real Ellen Ripley. The production values are strong, as are a lot of the visual effects shots which make the antagonistic beasts more dynamic than they ever have been, which obviously means that some people working on this project did a splendid job (production designers, the people handling the computer effects, make up effects people), but when all that effort is in service to such a paltry story about such inconsequential characters, even the technical wizardry feels like it is wasted. A pretty to look at film which has nothing interesting to say remains a pretty to look at film with nothing interesting to say. 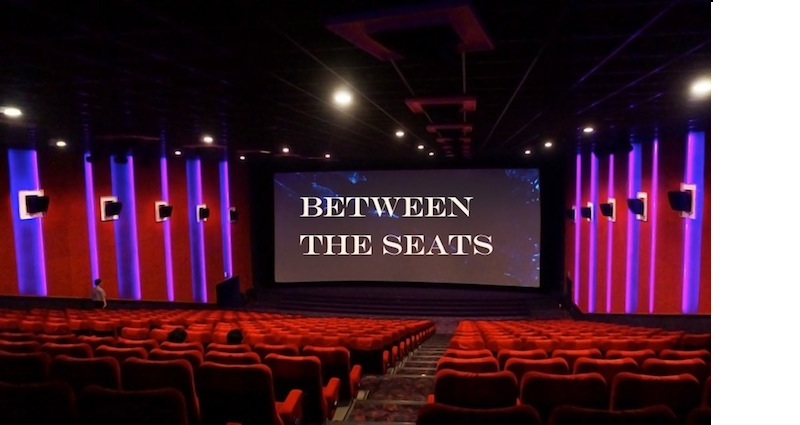 Being an addict of behind-the-scenes material on DVDs and Blurays, more than once have I heard visual effects people quoted as saying 'Our job is to help the director tell the story. The visuals always have to be in service of the story.' Very true, which has one wonder what the effects crew must have been thinking when they worked on this movie. At this point, is does not feel as though much can be written about the creatures and the special effects of the series. Jean-Pierre Jeunet however, to his credit, reserves a few surprises for the viewer, a couple of which are genuinely freaky, the others much less so, but more on that in the supplemental review. Suffice to say that Alien Resurrection is the bottom of the barrel so far as this franchise is concerned. Is it all bad? No, a couple of nice performances and some new manipulations of the aliens, while not saving graces, might be enough to earn the film the lightest of recommendations, although this is a far, far cry from where the series began.